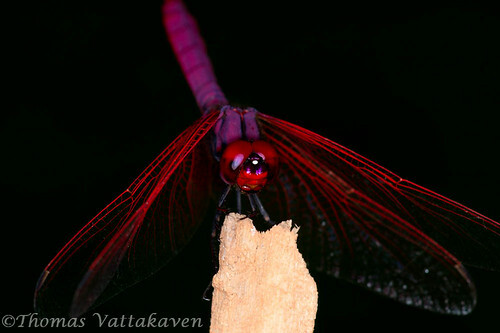 Dragonflies ( like this Crimson marsh glider ) are not just attractive, they can be surprisingly co-operative models too. You just have to figure out how to approach them. The trick is to get closer inch by inch. Try moving your body forwards instead of moving your feet. No sudden moves. Once your body has inched forward, you may inch your legs forward too. 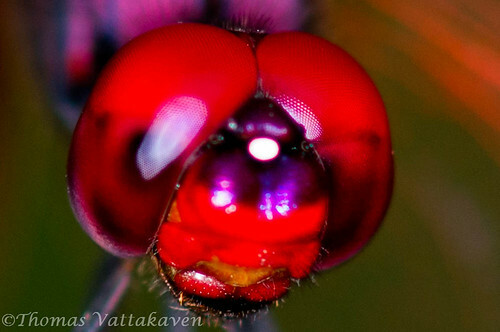 If you think that the dragonfly is about to fly away, stop, wait a while before repeating the above steps. 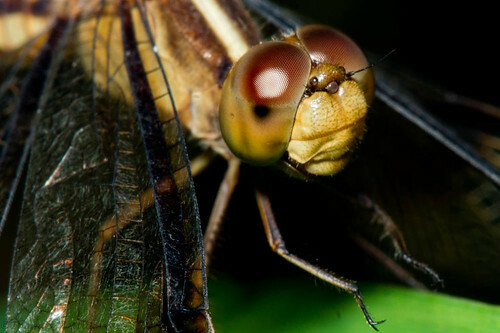 Even if a perched dragonfly flies off when you get really close, remain in position, and be prepared. There is a very good chance that it will return to the same spot. If you are luck you may even end up with a sharp mid-air shot as it returns. Try using an aperture that is small enough to offer sufficient depth of field to at least cover focus of both eyes and mouth parts ( I generally use f8 or more). Try to also take separate shots with focus points on the eye and mouth separately, you can always stack them together during post processing. 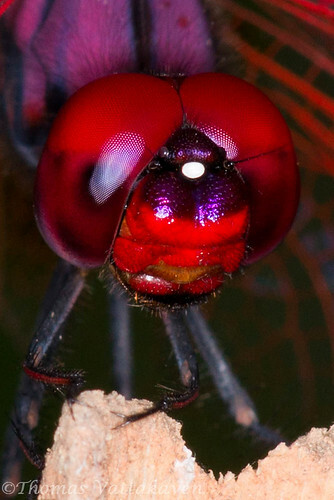 Dragonfly eyes are highly reflective, and the use of smaller apertures makes using flash unavoidable. The use of a diffuser can help reduce reflections. The use of ring-flash or twin-flash (if you can afford one) can get rid of shadows and help in a more balanced lighting of the face. As you try to get closer, continue shooting. 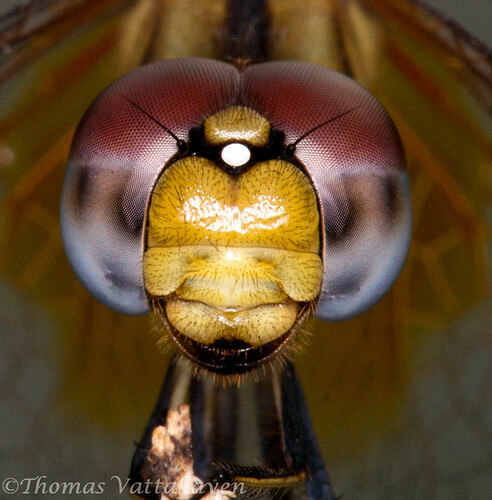 All dragonflies may not tolerate your approach, but you can at least have some good shots on your way to the extreme magnifications. Finally, try to shoot in RAW and crop your image. 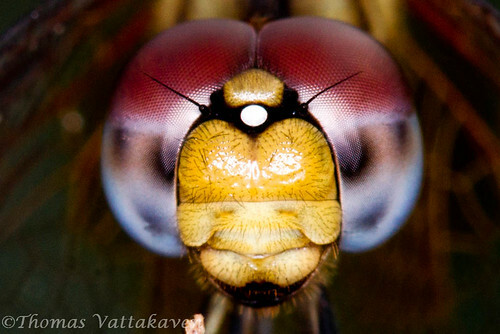 Most of us can only afford 1:1 magnifications, cropping close will more than triple that and with the huge megapixels in today's cameras and a bit of post processing, the extremes can be stretched. Just keep in mind that your images should be really sharp if you want to do huge crops. Keep a steady hand, and use your sharpest lens. Finally, pick an overcast day or early mornings for your photo shoot. 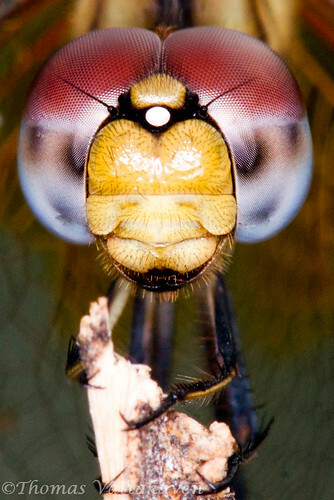 Insects are cold blooded and will generally be less active during overcast days and early mornings. They will therefore be much more tolerant during these times.